In 1880, Mandan, now a thriving village, felt keenly the need to banking facilities. Mr. Michael Lang, Mr. James Bellows and Mr. Hiram R. Lyons strolled through the the town site, seated themselves on a pile of rock and formed plans for organizing a bank. 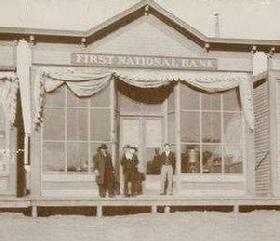 The First National Bank of Mandan was organized November 22, 1881 and was built that same year. 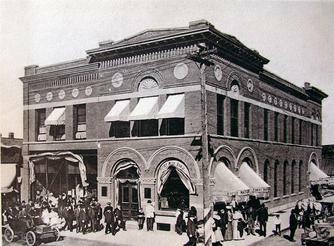 A frame building situated on the same spot where the three men had sat and planned its organization on Main Street, just one door from the corner of Front Street and Stark Avenue (now Collins Avenue and Main Street) the building on the corner, also frame, was owned by the bank and was occupied by the Taylor Drug Company. The first officers of the bank were President Edgar Haupt, Vice President James Bellows Cashier H.L. Lyons Directors Michael Lang, Le Reed, Edgar Haupt, Lovet Gill, James Bellows and Robert Hagar. In 1884 Mr. Lang was made Vice President of the bank. By 1906, deposits had increased twelve-fold and additional space was required to serve their clients. The original wood frame buildings were moved away and the current two story brick building covering the space formerly occupied by the two buildings was constructed on the northwest corner of Main Street and Collins Avenue. The building underwent a series of three remodeling/expansion in its lifespan. In 1911, the rear part of the building was expanded with a 46 x 12 foot two story addition. In 1927, the rapid expansion of Mandan's commerical base prompted another major addition to the north side. The two story addition was designed to match the original building and increased the total floor space by about 60%. In 1948, the exterior of the building was remodeled in the Greek Revival style. The west half street storefront window was replaced with smaller square windows while its doorway was shifted from the east to west side and accented beneath a stone garland. The large arched doorway and windows on the south and east side of the building were converted to a squared design. A new ashlar (squared building stone) facade covered the arches, complete with a projecting facade (pavilion) A fret scroll installed across the top unifies its appearance. The words "First National Bank" engraved across the main entrance between small versions of the second-story roundels. As was common banking practice in the 1920s, banks printed their own paper currency. Difficulty in managing counterfeit money and a need for tighter control on the money supply would force the practice to be discontinued. 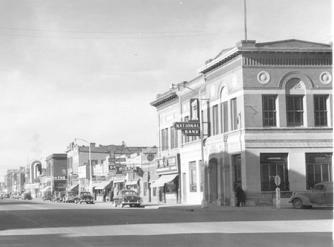 In September 1963, the bank's operation moved two blocks west and one block north to 111 North Second Ave NW to its current location. Housing 32 employees, the building was constructed at a cost of $350,000 (equivalent to $2.4 million in 2009) and was formerly the site of Remund Ford-Mercury dealership. Meisner and Co. of Bismarck was the general contractor, with Sanitary Pluming and Heating of Mandan and Power Electric of Mandan we the mechanical subcontractors. Robert M. Leslie was President of the bank at the time. The bank would eventually become part of the Northwest Bancorporation, which would subseqently be absorbed into the Wells Fargo family of banks. While the building itself is not registered on the National Register of Historic Places, the main portion of downtown roughly bounded by Main and First Streets between First Avenue NE to Fourth Avenue NW (including the Lewis and Clark Hotel) was listed in 1985 as the Mandan Commerical Historic District and included approximately 200 acres, 35 buildings, 1 object. The building continues to house several commercial services in the heart of the city, including law offices, a financial advisory and investment branch office, a coffee shop, occupational medical services and a physical therapy practice. The engraved "First National Bank" sign remains part of the structure.